It’s appropriate that this album is difficult to skewer in the canon. By 1974, John Cale had co-founded (and was ejected from) the most influential alternative rock band ever in The Velvet Underground. He had produced some albums (by The Stooges and Nick Drake) that would go on to prove genuine game-changers. He was involved in the nascent minimalist classical movement. These moments, revolutionary as they were, took a while to calcify in time. While The Velvets et al cast an indelible shadow, it was only over the proceeding decades that it truly lengthened. The shade of ‘Paris 1919’ remains even less distinct. That knack for the avant garde is not immediately obvious in this, his third solo album. It follows a rather tentative Rock ‘n’ Roll affair, and a more stereotypical instrumental effort. Although chiefly known and prized for his experimental tendencies, this side of John Cale is not foregrounded on ‘Paris 1919’. The music is bright, the arrangements occasionally complex but never abrasive. Organs and orchestra sweep through the songs here, along with Cale’s signature viola which he allows to chime rather than screech (as he thrillingly insisted on in the VU). A warm burst of organ opens the album on Child’s Christmas in Wales, immediately more flushed and positive than anything in Cale’s previous catalogue. The title (robbed from countryman Dylan Thomas) and the exhilarating drums fills create the nostalgic rush of a child’s perception of Christmas: not so much memories but bright, faintly blurred images of green candles, mistletoe and oranges. It soon becomes clear that this mode of impressionistic lyricism is where Cale’s experimental side finds its outlet. The lyrics throughout are inscrutable but meaningful, like words being read at random from the obituary of fascinating person. The chorus of Hanky Panky Nohow is sung more earnestly and wistfully than its (apparently nonsense) lyrics have any right to expect. Deep reverb coats the acoustic guitar, as more straightforward snippets of lyrics occasionally emerge: “Nothing frightens me more / Than religion at my door”. On The Endless Plain Of Fortune stately horns adorn Cale’s vague images of warfare, building to a cinematic crescendo and expanding the scope of the album from the personal across early 20th century Europe. Indeed, geography is a beguiling theme of the album. Cale is partly preoccupied with great European citadels of war and peace, like Berlin and Paris. However there is equal significance in his use of more obscure locations: Segovia and Andalusia in Spain, Norway, even Chipping and Sodbury (a tiny English village). Cale sounds both dislocated and obsessed with location. Andalucia closes the first suite of songs. With its subtle slide and fingerpicked acoustic guitars, it is delicate and gorgeous. Although clearly a love song, it is unclear to who or what. Cale picks unconventional, unfashionable topics to explore: he sings dreamily about “Andalusia, castles and Christians” mythologising the history of that part of Spain, just as he mythologised his personal history on Child’s Christmas in Wales. The effect is a blend of indistinct, deeply personal emotions with a huge, historical canvas. He soon finds rooms for a few meatier numbers. Macbeth is a bluesy stomper that serves as the album’s midpoint. Graham Greene is in a similar vein and not just for its literary references. With nods to theatre and vaudeville, both rather shake us from the immersion of some of the more contemplative songs, adding texture to the album. Paris 1919 is the most audibly arresting song, managing to sound quite unlike anything else here despite being composed of the same constituent parts as the other songs. Staccato viola and grandiose, ominous horns recreate the grandeur of French high society while Cale seemingly frets about the Treaty of Versaille. “You’re a ghost, la la la la la!” sings Cale, half urgent half manic, before creating perhaps the most absurd and affecting image of the album, of Beaujolais raining down on the Champs Elysses. Half Past France sees Cale initially portraying a soldier on the train home from war (“wonder when we’ll be in Dundee”) before his mind wanders again. In the end he simply repeats, in perhaps the album’s most lucid line, “we’re so far away, floating in this space”. Finally, as if the effort of producing such a direct lyric has exhausted Cale, Antartica Starts Here closes the album with him mumbling some of the most cryptic images yet over a slinky keyboard and meandering bass. 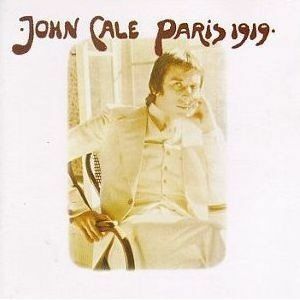 Widely regarded as Cale’s solo masterpiece, and released a year after that of his Velvet Underground counterpoint, it’s interesting to compare ‘Paris 1919’ to Lou Reed’s ‘Transformer’. That album felt genuinely transgressive when it was released. Now, it’s a rock standard, almost quaint. ‘Paris 1919’ however has only become more mysterious in the intervening years. Its themes and motifs (turn-of-the-century politics, impressionistic lyrics, remote parts of Europe) remain as unfashionable as ever. ‘Transformer’ (like The Velvet Underground and the Stooges) foregrounded its otherness in a way that was shocking at the time but is familiar now. ‘Paris 1919’ contains the same otherness but bears it more bashfully, thoughtfully. In doing so, it is less immediately shocking than much of Cale’s storied career, but picks at something more universal and human.